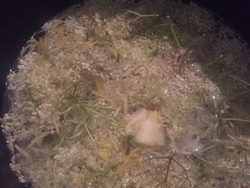 Making Elderflower Champagne is something that we look forward to every year. The Flowers can start to come out in late May but normally you won’t start seeing them until June. Once they are out we get to work brewing hundreds of litres of this stuff, which is great fun to do and really tasty. 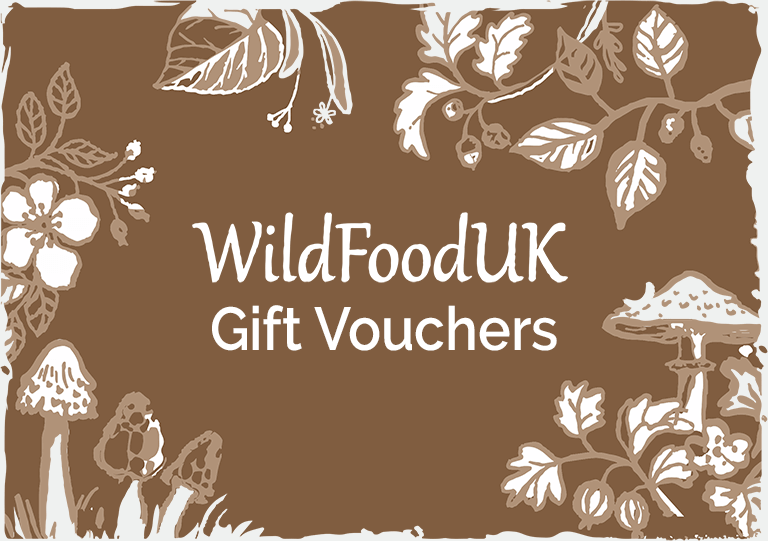 We brew enough to make sure we can bring some along for each of our Autumn walks. Elderflower champagne is a lovely refreshing Summer drink. If you stick to the simple recipe then it will not get above 2% ABV, so you can enjoy a fair few glasses in the sun. If you wanted to get a bit tipsy though; it makes a great vodka mixer ;). It is worth noting that we only use the common black elder, Sambucus nigra for anything we make to consume, all the others contain cyanide inducing glycocides which you do not want to eat. 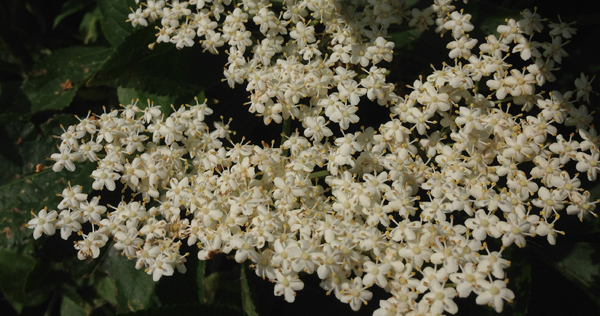 Almost all the elder you find growing in the wild in the UK will be the black elder, but there are now numerous ornamental varieties in peoples gardens and around towns. Identifying the Elder Tree is fairly easy when the flowers come out. There are a number of lookalikes but Elder is so common it should not take you long to find some. As well as the flowers it has fairly distinctive bark as shown in the video on the left. Once harvested the flowers quickly develop the distinct smell of cats wee! The recipe I use is the simplest one I can find anywhere, but it seems to work as well as any others I have tried. You can add champagne yeast to make it a bit stronger, but that will also make the mixture more explosive. 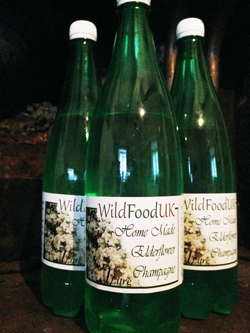 If you do use champagne yeast then you will need to burp the bottles daily to make sure they don’t explode. We’ve tried messing around with the recipe, adding other flavours such as raspberry but none of those mixes have worked anywhere near as well as the plain Elderflower Champagne recipes. Sterilisation of the bins bottles and any tools used is easy, just get some sterilising powder or milton, add it to some warm water in the bath and immerce everything you use in it for about 10 minutes and let them dry. You really don’t need to worry too much about contamination with elderflower champagne though as it has such a short shelf life anyway. The Ingredients for roughly 10 Litres of my simple recipe are as follows. The (very simple) method; as follows. Put the Water, Sugar, Lemons (juice, zest and some of the lemon remains) and white wine vinegar in the bin and stir vigorously to get the sugar dissolving. Stir daily until all the sugar is disolved. You can disolve the sugar in some of the water before starting the mix by gently heating it in a large saucepan, and most recipes advise this; but I find that the sugar disolves by itself after a couple of days anyway as long as you stir it well each day from the bottom. After 4 – 7 days the mixture should start to get some mould growing on the top, normally starting around the floating lemon remains. This means the reaction that you want is taking place, not that it is time to throw it away! When you see the mould, remove everything floating in the mixture with your (clean) hands. Then strain the mixture through a sieve then a muslin a couple of times until all bits are properly removed. Finally line your funnel with the muslin and strain the liquid directly into plastic bottles. I make a small depression in the neck of the bottle before screwing the lid on tight. When the champagne starts to get fizzy the depression will pop out, showing you that it’s working, it’s also a very satisfying sound if you are near to the bottles when it happens :).